Project THRIVE is giving a unique dose of healing to help traumatized victims of violence recover. Led by the Mobile Police Department Office of Strategic Initiatives, Project THRIVE is joining SouthSounds to offer a songwriter competition. SouthSounds Music and Arts Festival is known as the first and most successful festival in the country dedicated to showcasing new Southern musicians and artists. Therefore, it’s a perfect platform for attaining the goal of making Mobile a trauma-informed community by way of music. “Trauma, whether physical or mental, leaves an imprint on the life of its victims and those who love and support them,” said Curtis Graves, commander of the Mobile Police Department Office of Strategic Initiatives. The Project THRIVE Songwriter Competition is an opportunity for songwriters to help lift traumatized victims by giving them a song spirited with healing and triumph. It’s also designed so that the citizens of Mobile can educate themselves on the causes and effects of trauma. 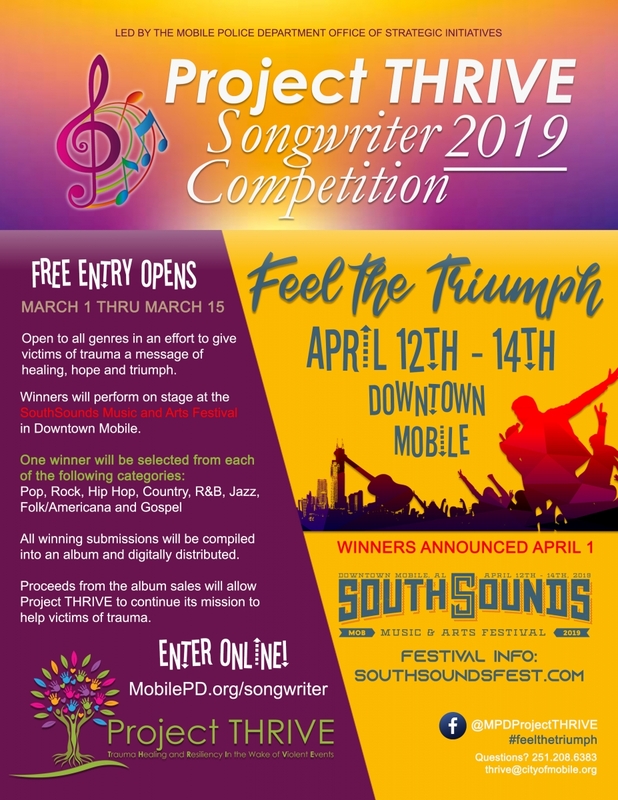 The submission window for the Project THRIVE Songwriter Competition opens online at mobilepd.org/songwriter March 1, 2019 and closes at 11:59 p.m. March 15, 2019. To enter is free. The winners of the competition will be invited to perform their song on stage at the SouthSounds Music and Arts Festival held April 12 – 14, 2019 in Downtown Mobile. Winning submissions will be released on a Project THRIVE digitally-distributed compilation album. Winners will be chosen by a panel of judges who are noted local industry professionals. Songs will be blindly judged based on melody, composition, originality and lyrics. Winners will be announced on April 1, 2019. Proceeds of album sales will be reinvested back into Project THRIVE. The funds will be used to expand its mission of helping victims overcome trauma due to violent events. For more information on rules and regulations of the Project THRIVE Songwriter Competition, visit mobilepd.org/songwriter or call the Mobile Police Department Office of Strategic Initiatives at 251-208-6383.